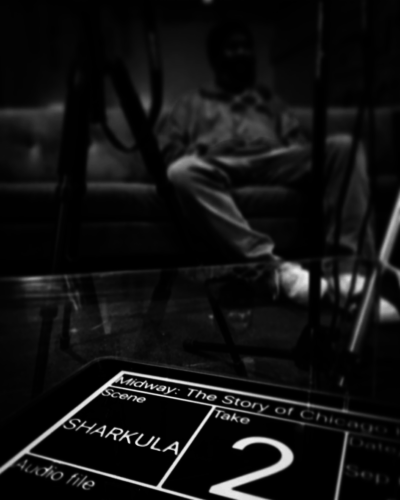 The creators of Midway Documentary, Ryan Brockmeier and Chad Sorenson, believe that behind the success of big names in Chicago hip-hop are many unheard stories of artists who built the genre. The Legendary Traxster is one such artist who had an undeniable impact. He is largely credited for creating a new cadence in which a rapper’s flow rides with the rhythm of the hi-hat instead of the downbeat. And Shabba Doo, a dancer born and raised in Cabrini-Green, became famous with The Lockers, a Los Angeles dance group, and later starred in the 1984 indie film Breakin’, one of the earliest and most influential hip-hop movies. Brockmeier—the director, co-writer, and producer—began outlining the documentary and archival project in December 2013. Sorenson, a Chicago DJ known as DJ Risky Bizness, was the first person Brockmeier called, and he is now the lead researcher and producer. The core team also includes Kevin Beacham and Rahsaan “DJ Sean Doe” Hawkins. In July, the project partnered with Columbia College and its Center for Black Music Research to further develop its hip-hop archive. The archive will cover the early dance and graffiti scenes from the 1970s, the drill scene and the rise of independent rappers, and all of the stories in between. Chicago’s early hip-hop scenes never received the same major label attention cities like Los Angeles or New York City have often taken for granted. Major labels were not seeking out people from Chicago to sign, according to Sorenson. “If you start giving a market its own infrastructure and room,” he said, “they’re no longer going to buy New York records or LA records.” This, Sorenson explained, was in large part why Common and other Chicago giants had to leave the city to find a career. For Brockmeier and Sorenson, two Chicago locals, the city’s hip-hop community encompasses more than just the music and the culture that both surrounds and sustains it—it is also a profound representation of the strength of the community itself. The survival and triumph of hip-hop in Chicago, a city that has historically been segregated by race, ethnicity, gang affiliations, and socioeconomic status, have been a testimony to hip-hop’s ability to unite different groups within the same genre. While people like Chance the Rapper and the success of his Magnificent Coloring Day, a day-long music festival that sold out U.S. Cellular Field, have recently brought Chicago some well-earned praise, mainstream media portrayals of both Chicago and its hip-hop culture have often been less than flattering. Subsequent examinations of hip-hop in Chicago—like Spike Lee’s 2015 film Chi-Raq, which also uses Englewood as its backdrop—are no exception to the trend of exploiting the violence in Chicago and using it to demonize entire neighborhoods and the people living inside them. For both Brockmeier and Sorenson, the rise of Chicago’s early talents are thanks to the city’s “independent hustle” and “blue-collar mentality,” and an ability to find success despite the city’s lack of major-label attention. One example is E.C. Illa, a legendary white rapper from Chicago and one of Eminem’s earliest influencers, who self-produced and shot a music video for about $1,000 that eventually landed on national music outlets like BET’s Rap City and The Box. The same strain of uncompromising independence can be seen in the younger generation of Chicago artists, such as those, including Vic Mensa and Chance the Rapper, affiliated with the independent Savemoney crew. While these young artists are open fans of their predecessors, Brockmeier and Sorenson hope that their documentary can help both artists and audiences learn more about their own history, and are proud of the work ethic and talent of younger generations of Chicago’s hip-hop artists. According to Brockmeier and Sorenson, the entire project has been funded out of pocket for nearly three years. Sorenson, who is the owner of one of the largest music collections in Chicago, still faithfully searches eBay auctions to find rare records for the documentary. The project is also receiving donations of important historical Chicago hip-hop artifacts and hopes to present them at an exhibit near the release of the documentary, which is slated for November of 2017. Recently, the Ill State Assassins, a rap crew whose members (like E.C. Illa and The Legendary Traxster) were some of the most talented and famous artists from Chicago, donated an authentic, vintage, and highly coveted eighties Ill State varsity jacket to the project.